Wild German performance cars ain't dead. Far from it. Every day it seems we’re hearing more about advancements in autonomous and EV technologies. Pretty soon we’ll be riding (not driving) around in EV pods hailed to our homes via a smartphone app. In the meantime, BMW’s M division will continue doing what it does best: breathtaking performance and handling. Autocar recently caught up with M division chief Frank van Meel and talked the future of M, specifically the 2019 BMW M3. “Along with the M5, the M3 is a crucial car for BMW,” van Meel said. 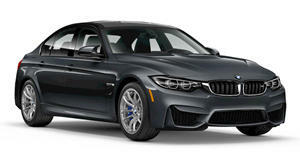 “It wasn’t the first fully fledged M car but it continues to stand for everything the brand is based upon.” That said, expect the sixth-generation M3 (and M4 coupe and convertible) to utilize greater use of aluminum, high-strength steel, and a number of carbon fiber components in order to keep total weight below the just unveiled 3,500-pound M3 CS. As of now, power will come from an upgraded version of the twin-turbo 3.0-liter inline-six, paired to either a six-speed manual or eight-speed automatic (note the absence of a dual-clutch). Expect at least 465 horsepower. However, the biggest news van Meel revealed is that the M and M Performance divisions will soon begin a major expansion with a 26-car armada aimed directly at Mercedes-AMG and Audi Sport. The goal is to match AMG’s annual sales of more than 100,000 units. To achieve that number, sources claim that within the next two years, several new mid-range four-wheel-drive M-Performance models will arrive. Some of these will include a more powerful X2 and even the eventual X7. No doubt this is an ambitious strategy on BMW’s part, and we doubt any driving enthusiast anywhere in the world will complain.